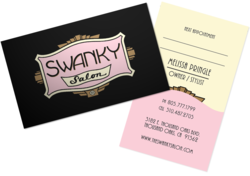 Egency's hair salon business cards helps Swanky's find new clientele. my cilents will often give the salon business card to a friend...it's really too attractive to just throw away. Egency announces ten new designs for its Beauty & Salon category as well as a new "upload your own" feature for customers. The new designs provide a focus for hair salons to find and retain customers. The new designs were created specifically for salon owners, stylists, and manicurists. Whether you want to promote your salon’s grand opening, a new color service or a special rate for wedding hair styling, a salon business card from Egency can project a professional, positive image to new or returning customers. Melissa Pringle has been cutting hair for years, but opened her own salon, Swanky’s Salon, in 2011. In a short period of time, she has become an institution among the fashionable in Thousand Oaks and Westlake Village, California. Ms Pringle already had a design for her business card, but wanted to have them printed on high quality paper. “My salon business card is often the first impression that someone gets of my salon,” comments Ms. Pringle. “For me, the visual on the card, as well as the premium feel of the smooth finish, helps to set my salon apart from others. You can hear Ms. Pringle’s story in a new video from Egency. In the video, you can see Swanky’s Salon and hear Ms. Pringle, in her own words, describe how Egency and her salon business card has helped her salon grow. View the video at http://www.youtube.com/watch?v=bEQsxUh1EEg to see Egency at Swanky’s Salon. In addition to the upload your own feature, there are several new designs in the Beauty & Salon category. Among these designs are: Black Wood Grain, Soothing Green, Salon Ribbon and Butterfly Beauty. Also included is a new classic men's barber design called Red White and Blue Barber Pole. Egency is a new generation web-2-print service providing customizable marketing solutions. These are well suited to an extensive range of businesses that include real estate, the beauty industry and more. Designers from across the United States create each individual design to represent a variety of styles and tastes. Most business cards also include matching designs for postcards and flyers, making for a complete marketing kit for any professional. Egency, based in Thousand Oaks, Calif., provides high-quality design solutions for businesses. For more information, contact Egency Marketing at (805) 277-6790 or marketing@egency.com.